We’re working hard to return vitality to Downtown Blue Springs so that it will once again be the heart of our community. We have much to offer and hope you will find what you’re looking for. 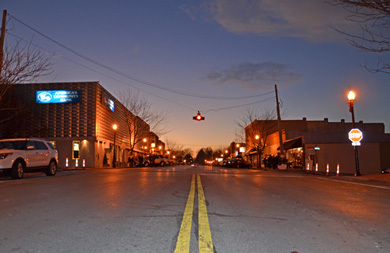 Please feel free to browse around our site, and most importantly, we would love for you to visit us here on Main Street! Click HERE to see photos from our Piccadilly Gala!! On March 13, 2014 we opened for business at our Main Street location… This has been a great move for us! Our sales in our first full year on Main Street reflected over a 50% increase and we still continue to see growth each month over last year’s sales numbers. Additionally, we have increased our staff from 3 full-time and 10 part-time to 7 full time and 16 part-time employees. We thoroughly enjoy our new location and being a part of the Downtown District! Beautiful little quaint store! Perfect for downtown Blue Springs! Everyone at Marshel’s is great and I particularly love Bev the massage therapist. She is gifted! My children and I love to go to Inklings Bookstore. Eve is very helpful and has a wonderful selection of books at great prices. We are very excited about the coffee shoppe going in on the lower level. This will be a great spot to hang out! Genevieve’s opened in 2012 and was originally located in a strip mall on 7 Highway. In 2014, we made the decision to move the store into a house in downtown Blue Springs. Since the move, we have experienced a substantial increase in foot traffic and a 15% increase in annual sales. We continue to welcome new customers on a daily basis who were unaware of our location on 7 Highway.